This exercise demonstrates the effects of gravity on the swing of a ball, as well as the spacing of the drawings in the action. Using the arcs, path of action and ease-in and ease-out concepts you learned about, create a new animation project in Harmony. In the Timeline view, rename the Drawing layer: Path. 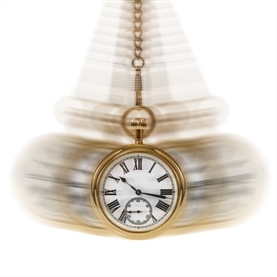 In the Camera view, draw the path of action of a swinging pendulum. 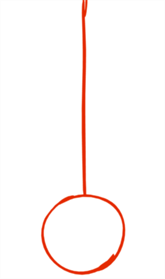 Draw a red stroke for each of the three key poses of the pendulum on the path of action. The mark should be positioned where you think the centre of pendulum's circle will be. Place eight more black strokes along the path of action, positioning the eight in-between drawings of the animation. To use your path drawing as a guide while drawing the animation, you will need to extend its exposure. In in the Timeline view, select the cell to which you want the drawing to be exposed. The exposure is extended to the selected cell. NOTE: If you have issues with the previous steps, you can import the 06-pendulum-path-timing-chart.tpl template. In the Timeline view, create a new drawing layer and name it: KeyPoses. In the Camera view, draw the three key poses for the pendulum in red, on the same drawing, using the Path layer as a reference. Try to keep your circles the same size throughout the drawings or the pendulum will look jiggly. NOTE: If you have issues with the previous steps, you can import the 07-pendulum-key-poses.tpl template. In the Timeline view, create a new drawing layer and call it: PendulumAnimation. Animate the swinging pendulum in black in this layer. Do not forget to use your Path and KeyPoses layers as guides and use the Onion Skin . Try to keep the proportion of your pendulum from drawing 1 to 11. Once you are done, turn off the KeyPoses and Path drawing layers. NOTE: If you have issues with the previous steps, import the 08-pendulum-animation.tpl template.